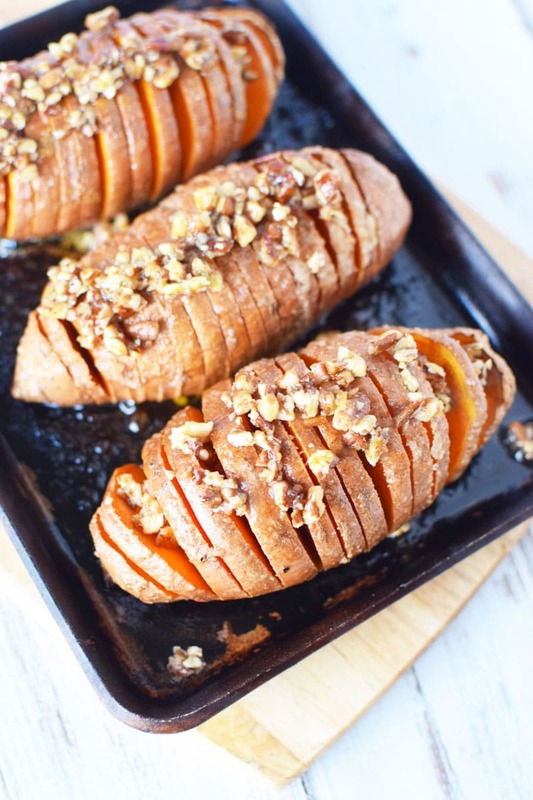 Hasselback Sweet Potatoes are an incredible side dish option perfect for fall. With brown sugar and marshmallows (optional), you don’t just have to serve sweet potato casserole to make a splash. Hasselback potatoes, cut in beautiful slices, are a fabulous side dish that is not only impressionable, but amazingly tasty. Here is the thing about holidays: we want to rush. 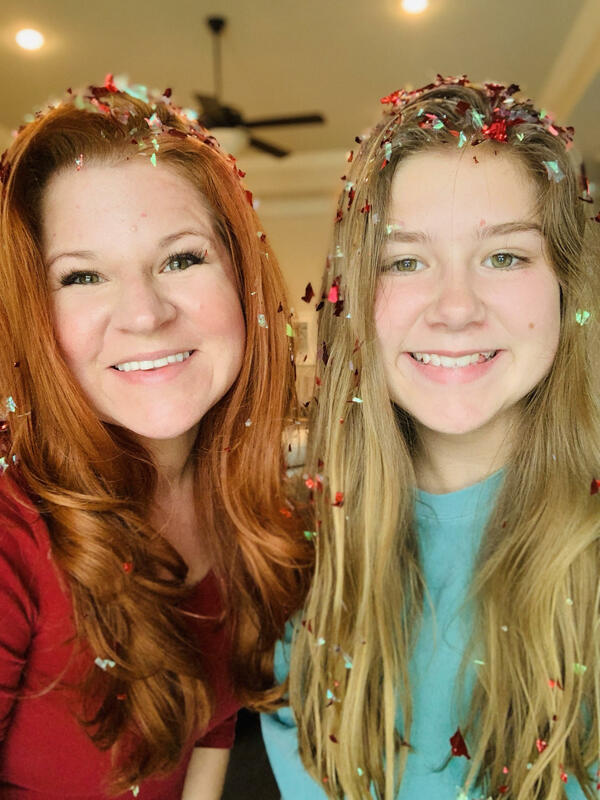 We are so busy with shopping, cooking, gifts and hosting that we don’t always step back and enjoy the moment. 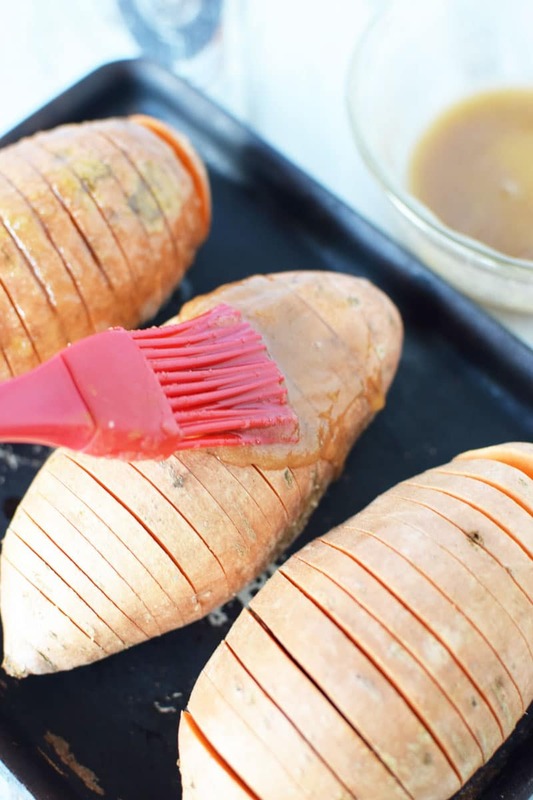 Consider these hasselback sweet potatoes your moment. No matter how hard you try, you cannot rush perfection…or potatoes. They need time to cook in the oven so if you are looking for a quick option, try this roasted asparagus. If you are looking for a delicious striking and mouthwatering option, make sure you preheat the oven and give it the hour that it needs to oven roast properly. Now you cant do it on this recipe, but its awesome to learn microwave sweet potatoes so you can enjoy them anytime. Looking for a traditional potato recipe? Try these hasselback potatoes stuffed with bacon. Cooking Tips: This takes about 10 minutes to put together and 50-60 minutes to bake. If you put this on a baking sheet (not a stone) I’d line it with foil. This is a sugar+butter combo which typically means it burns when not on the potatoes. 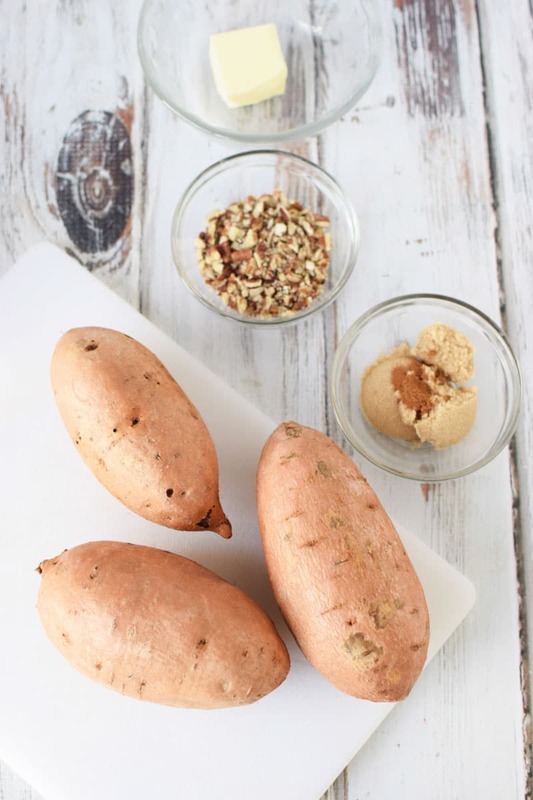 Use 2 spoons placed on each side of the sweet potato to cut 1/4″ slices into a sweet potato. Add melted butter, brown sugar and cinnamon together and use a basting brush to brush onto the potatoes. Mix together pecans and maple syrup and set aside. Bake for 50-60 minutes or until potatoes are soft in the center. 5 minutes before removing from the oven, add pecans and maple syrup, I found using my fingers worked best, and top each potato. You can also add mini marshmallows at this point if you like! Return to the oven warm up for 5 minutes. 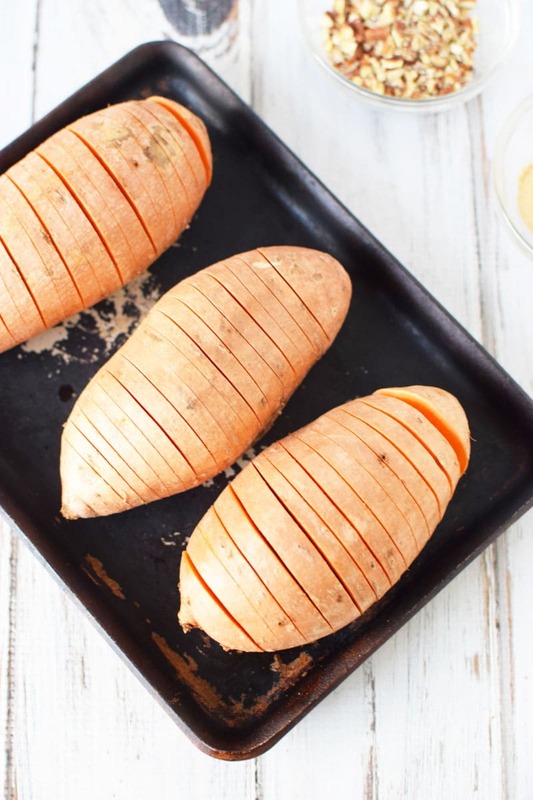 Use 2 spoons placed on each side of the sweet potato to cut 1/4" slices into a sweet potato. Place on baking sheet. Bake for 50-60 minutes or until potatoes are soft in the center. 5 minutes before removing from the oven, add pecans and maple syrup, I found using my fingers worked best, and top each potato. Return to the oven warm up for 5 minutes. Preheat oven to 400. 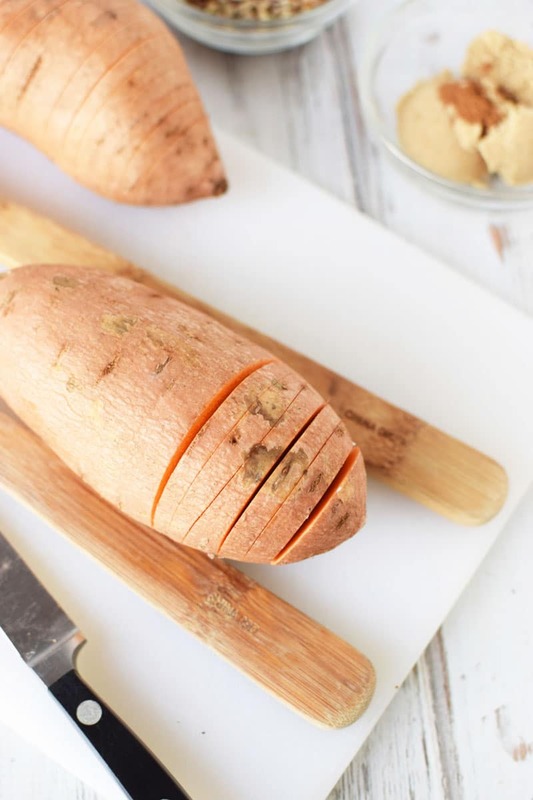 Use 2 spoons placed on each side of the sweet potato to cut 1/4" slices into a sweet potato. Place on baking sheet. 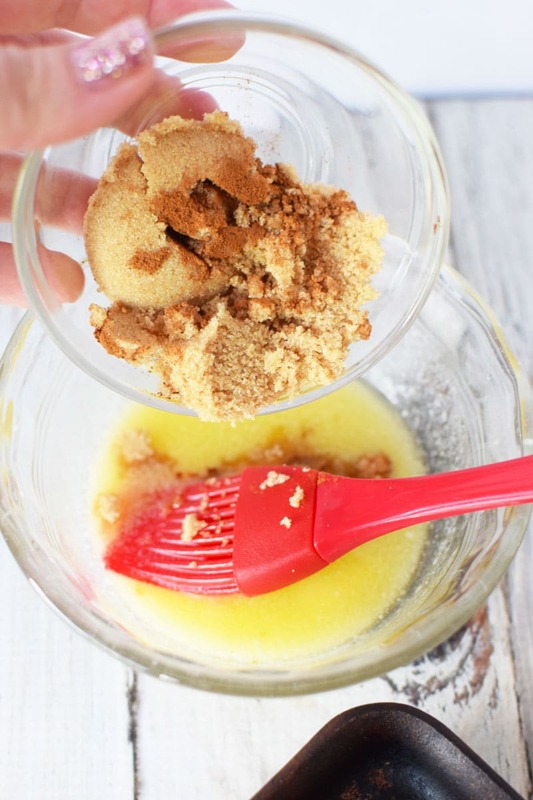 Add melted butter, brown sugar and cinnamon together and use a basting brush to brush onto the potatoes. Mix together pecans and maple syrup and set aside. Bake for 50-60 minutes or until potatoes are soft in the center. 5 minutes before removing from the oven, add pecans and maple syrup, I found using my fingers worked best, and top each potato. Return to the oven warm up for 5 minutes.